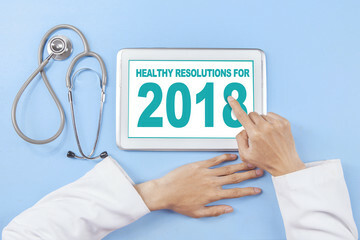 JAN 2018: Are These 4 New Year’s Resolutions On Your List? Do you make New Year’s resolutions? If so, what’s at the top of your list—losing weight, quitting smoking, exercising more? If you’re making resolutions like these, we certainly hope you’re successful. Here are a few other resolutions you might not have considered. 1. See your doctor. Many people—especially men—put doctors’ visits on the back burner. Men make 130 million fewer visits than women to the doctor each year. Whether you’re a man or a woman, it’s important to see your doctor at least once a year. During your annual visit, you’ll have your blood pressure checked, follow up on any tests or vaccines you need, and discuss ways to stay healthier. Try scheduling your annual physical during the month of your birthday. This makes it easier to remember, and it can be your annual birthday gift to yourself. Of course, if something comes up in between annual visits, don’t ignore it. Sprained wrist? Changing mole? Blood in your stool? Deep sadness lasting more than a couple of weeks? Don’t wait…. See your doctor. 2. Review your medications. While we’re on the topic of medical visits, why not resolve to come my way during the next month or two? We can review your list of medications, discuss any side effects you may be having, and come up with a game plan—along with your doctor—to improve how you’re feeling. I can also make suggestions for how to store medications and the safest ways to dispose of any expired medications you have on hand. 3. Eat mindfully. You’ve no doubt received lots of advice on what to eat. What about how to eat? Eating mindfully means you pay attention to your food while you eat it. You might be surprised what a difference this makes. Truly savoring your food may help you be more emotionally satisfied by it. You may also be able to “hear” your body’s cues, likes the ones telling you what your body is craving or when it’s time to stop eating. • First of all, slow down. Really smell, taste, and chew your food before swallowing it. • Don’t try to do anything else while eating, such as reading the newspaper or checking your email. • Use smaller plates to help with portion control. • Keep serving bowls a step or two away so you have to think twice before going back for seconds. • To help you slow down, put your fork or spoon down in between bites. 4. Reconnect with nature, others—and yourself. These days, many people are constantly wired. Give it a break, and try this resolution. Free yourself one day a week from all electronics: television, smartphone, computer, and tablet. Use this time to go for a walk in the park, play some music, read a novel, try a new recipe, or reconnect with a neighbor. Many people find that taking a break from electronics helps ease their anxiety and stress. What a great way to ring in the new year—more relaxed and present for yourself and those around you!